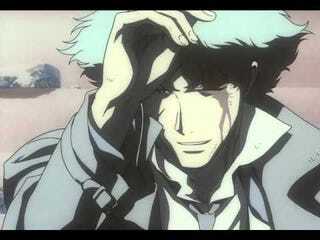 Cowboy Bebop is a thrilling episodic narrative of a space cowboy who lives bounty hunting. The show is a science fiction love tale to what once was the old west. Making its epic debut alongside its incredible main character in October 1998 with the action packed, adrenaline rush, laid-back badass of the year (2071,) Spike Spiegel. “Asteroid Blues” the opening episode of this praised anime begins with a flashback of Spike being held up at a church. Quickly after we see Spike with his partner Jet Black traveling to the first bounty we see this series. Throughout the full episode we learn what makes this show; from the witty humor, to smooth animation with beautifully rhythmic fighting scenes, unique science fiction technology to a complete and well-designed plot, to the sense of sympathy towards criminals and the endurance of our bounty hunter Spike Spiegel. Encompassing all of what makes Cowboy Bebop great is displayed within this first episode. Throughout the series we gain three more primary characters Ein the adorable corgi, Faye Valentine the un-cryogenically frozen debt ridden female bounty hunter, and finally there is Edward the young sexually ambiguous tech savvy female hacker. Each character gets their own individual debut episode giving all three a sense of realty and background. All characters travel in the spaceship Bebop venturing through the sol galaxy seeking out bounties while simultaneously confronting their past. Incredible atmosphere and sense of universe is shown brilliantly in the series. Space highways that extend to colonized asteroids and cities, floating fields of metal suspended in space and ships with models from old to new give the solar system a feeling of industrialization and closeness. This creation of a futuristic solar system is embedded naturally into the plot bringing this view to life in the most effortless of ways. Most episodes entail a bounty venture that takes the characters or a select few of characters through a journey that leaves an emotional impact by the closing words. One example of this can be seen by how close the show makes you to a character and then have their death by the end of the episode they are introduced. “Waltz for Venus” is my personal favorite example; the episode begins with a young character named Rocco who wants to be trained by Spike. Spike agrees, but shortly after he finds there is a bounty on Rocco’s head. Between the beginning and end of the episode we learn that Rocco only has a bounty because he wants to cure his sister’s blindness (ironic right.) During a seen of mobsters battling Rocco and Spike, the fruits of Spike’s training is seen within Rocco and impresses Spike and fills Rocco with joy and a sense of closeness is then shared between the two in this moment, but then it is quickly dissolved as Rocco is shot before Spike. Most episodes are like this in the sense that an initial bounty will lead to an incredible journey that will leave the audience with a strong emotional response by the end. Spike is the most complex of the main characters having the most ambiguous past and a nonchalant view of death. This view comes from his acceptance of death and his belief that his current life is but a dream. Gathering information from the short flashbacks and well developed dialogue helps to form an idea of Spike’s past. Once crime syndicate mobster he falls in love and decides to leave the syndicate life, when his love Julia doesn’t choose to leave alongside him he goes rouge and leads his life as a bounty hunter on the bebop until his confrontation with the past. Chilling nemesis and once partner for the syndicate Vicious is the ideal villain of Spike. The dark half of spike, they both hold equal skill and indifferent attitude to everything around them. Well-paced, the conflict between the two grow until the incredible showdown of these two for the final episode. If there is one motif that is held most important throughout this series, it is the idea of letting go of the past. Both Faye and Jet are able to leave the past behind as they develop near the end of the series. But, in the grand finale of Cowboy Bebop the climactic moment of Spike confronting and letting go of his past leads to his most likely death. The show ends with a close-up of Spike Spiegel pointing his finger in a make shift gun at the syndicate followers after his tremendous battle with Vicious and uttering “Bang” before collapsing into a pool of his own blood. This ending is impactful emotionally; right as Spike is able to move beyond his past and lead a normal life, our space cowboy collapses. Cowboy Bebop sits on the summit of anime and furthermore television greatness. Incredible in most aspects and excelling for what it is. This show is a must watch to those who enjoy quality television. Should Player Unkown&apos;s Battleground Be a Contender For Game of The Year?